Key West... just the name inspires passion, color, beauty, history, culture... The Original Key West DestinationTM Hook Bracelet is, and has been for almost a decade, a tribute to the island atmosphere artfully and masterfully created by this island and her people. 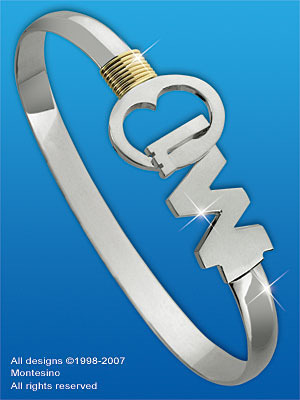 The Key West DestinationTM Hook Bracelet is fashioned after and old skeleton key that bends around your wrist and the "W" hooks into the key to symbolize the hook that this island has on your heart and soul. The 2X4 wrap of 14 karat gold symbolizes the 8 square miles of our island at the end of the road, vibrant and alive with sunsets, blue waters and Duval Street beckoning to all the senses. Come on down, for a week... or a lifetime.